Forget boring old phones and tablets. 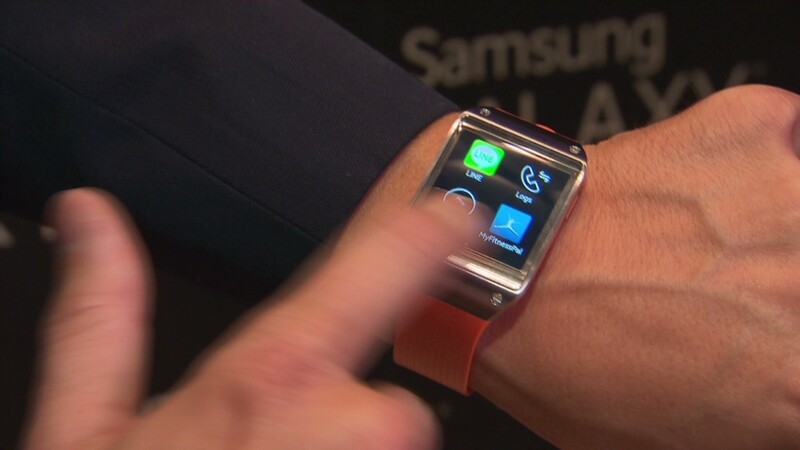 Smartwatches are the hottest trend in tech, and Samsung is jumping into the market with the new Galaxy Gear. The $299 Gear watch is not a phone. Instead, it links up with Samsung's Galaxy smartphones and tablets to let users know when they receive a call, text message or e-mail. Samsung co-CEO J.K. Shin unveiled the smartwatch at the IFA consumer tech conference in Berlin on Wednesday, and he said the Gear will begin shipping to 140 countries on Sept. 25. The U.S. and Japan won't get the Gear until October. Shin sported his own Gear, which includes a 1.63-inch watch face and runs on Google's Android operating system, during his brief discussion of the new device. The watch strap is available in several colors, from black to "oatmeal beige" to "wild orange." More details came out later in the event, when Pranav Mistry -- the head of Samsung's think tank team -- described how Samsung set out to create "something out of sci-fi." Mistry also showed off how Gear users can "point your wrist and shoot" both video and photos. Other features include a pedometer and an option to make the watch beep if it has been misplaced. Shin called the Gear a "perfect companion" to the Galaxy Note III smartphone. Samsung also revealed the new Note III on Wednesday, in addition to a new Galaxy Tab 10.1 tablet. Like the Gear, both the new tablet and new smartphone will also launch Sept. 25. The Gear will be compatible with only the Note III phone for now. Samsung said after the event that it couldn't confirm when or if other Galaxy devices will be compatible. Samsung will face loads of competition in the smartwatch space. Startup Pebble smashed fundraising records on the crowdfunding site Kickstarter, and big tech firms such as Motorola, Sony (SNE)and Casio have released their own watches. Behemoth Apple (AAPL) is strongly rumored to be releasing an "iWatch," and Google rumors are swirling as well. Op Ed: Who needs a Samsung smartwatch anyway? The products have become more tech-heavy since then: The current slate of wearables includes highly specific trackers focused on heart rate, exercise intensity and sleep patterns, as well as more futuristic applications like the eyeglass-computer Google (GOOG) Glass.